Seminars - EFT/EMF and other Healing Modalities Training with teachers and trainers from overseas e.g. USA/United Kingdom/Australia and Malaysia. are greatly welcomed. We will be delighted to hear from you! 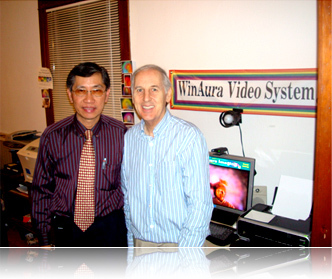 Guy Coggins, founder of WinAura Imaging Systems, with Anthony Wong of Success Coaching and Consultancy Pte Ltd who is Singapore Distributor for the Aura Imaging equipment during one of the visits in 2007 at Redwood City, USA.